When we last we left The Queen of The Jungle, she was launching dual investigations into a group of soldiers enslaving the local natives and reports of a jaguar attacking a local archaeological dig. The case has quickly become personal for Sheena (a.k.a. heiress Rachel Caldwell) as her pet jaguar Yagua has been implicated in the attacks and is being hunted by the ruthless Colonel Pinto of the Val Verde Secret Police. And that's ignoring the rumors of a race of jaguar men, who legend has it made use of the recently uncovered temple to perform dark rites involving human sacrifice and cannibalism! Sheena #2 is an improvement on its first issue in every respect. As I noted in my review, the first issue was an enjoyable read but I feared it presumed too much in thinking the reader would already be familiar with the established cast first introduced in the 2007 Sheena mini-series. 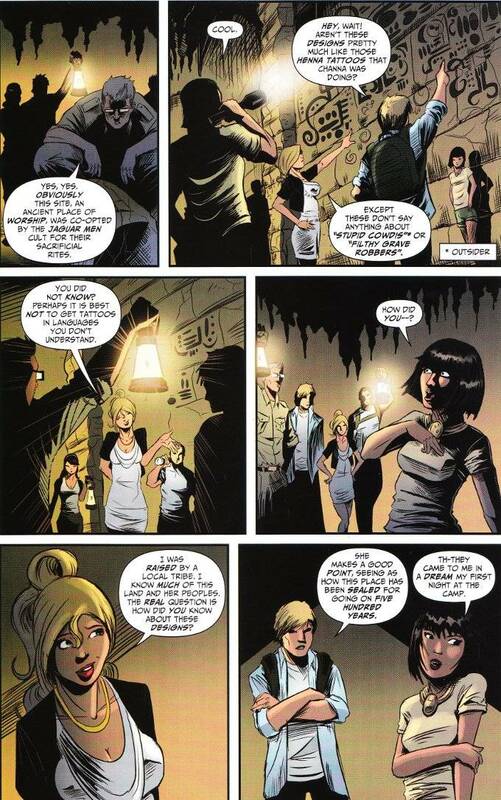 By contrast, this issue takes care to introduce us to all of Sheena's supporting cast and identifies them all by name. This issue also features a number of good character moments that the first issue lacked. My favorite of these involves bodyguard Martin Ransome - a man's man if ever there was one - showing he's more than dumb muscle after being called 'Sherlock Holmes' sarcastically. There's also a funny bit where Sheena fights against the bimbo stereotype she normally plays at being in her secret identity, in a tribute to a classic joke. The artwork by Shawn McCauley is a perfect match for the story. McCauley's general style is exaggerated in a way that is reminiscent of the great Will Eisner - fitting given that Eisner was one of Sheena's co-creators! This streamlined style lends itself well to the issue's fluid action sequences but also allows the characters some intricate expressions in their close-ups. Bottom Line: If you're a fan of classic pulp adventure comics, Sheena should be on your pull list.